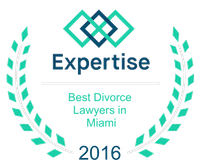 Divorce Through Mediation | Miami Family Law Lawyers Vilar Law, P.A. It's become a popular idea that the only ways for a couple to go through the divorces process is for each party to hire their own lawyers, and go through the proceedings in a possibly combative way. The idea of each party hiring attorneys is so pervasive, unfortunately there's never a consideration for something that is cooperative. Divorce Through Mediation approaches a divorce from a different angle. As opposed to both parties choosing their own attorneys to represent each of their own interests separately, a single State Certified Mediator (in Florida) is chosen to act as an intermediary between the parties to form on an agreement on their divorce without necessarily involving attorneys. There's a mutual desire for divorce. If one party is pushing for a divorce, while the other party would be resistant, then mediation is probably not the best solution. There are no lingering feelings of wanting to revive the marriage. This can become particularly sensitive as the proceedings move forward, and one party, or the other, may try to complicate the matter. Both parties expect to remain on good terms with the other. This is especially important if there are children involved. There is transparency with each party's financial status. Often, one of the more complicated aspects of a divorce, and why having one's own attorney is important, is if there's a difficulty in divulging financial records, or information regarding other assets. There has been a commitment to honesty between the two parties. Just like with the example above, unfortunately as emotions get involved in any legal proceedings, and that's especially true with divorcees, there can be a tendency to obfuscate financial and property matters. Simply put, openness and honesty is what makes a Mediated Divorce successful. There's room for disagreement without resentfulness. In a perfect world, everyone understands the other person's perspective, but this just doesn't hold up to scrutiny. There is always possible disagreement between the parties, and a mediation can only work if there is an ability to resolve those disagreements in a mature way. One party is not intimidated by the other. The very nature of relationships means that there will be different power dynamics between the two parties. If that kind of dynamic exists within a person's marriage, then it will exist while it's ending as well. If there has ever been any physical violence between the parties, then a mediation is not the best option in their divorce. If there's a determination that Divorce Through Mediation is the right decision for a situation, then it's important to note that there will be many benefits to enjoy. There is a significantly lower cost involved, some estimates put it as low as a 10% less than a Traditional Divorce. Additionally, a Divorce Through Mediation saves a considerable amount of time, approximately two years are spent in a traditional divorce, while a Divorce Through Mediation may only take 6 months. Unfortunately, a major downfall of choosing to go the route of Divorce Through Mediation is that if the terms can't be agreed to through mediation, then the entire divorce proceedings must be started from scratch, wasting both time and money. That's why it's important to receive the best legal advice you can from a trustworthy attorney. VilarLaw provides legal representation for both Divorce Through Mediation and Traditional Divorces. And since both are handled in-house, then you can be assured that your interests will be what's most important, be it through a Divorce Through Mediation or any other form of Divorce. Please contact the VilarLaw offices at (305)373-8000, to see if a Divorce Through Mediation is your best option, or if another option suits your situation best.